I'm pretty sure Mary Weber just likes to toy with my emotions. I always come out of her books with the all these FEELS. And also, she is the sweetest person on Twitter ever because she's very nice to me as I flail in my feels to a million tweets directed at her as soon as I put down the book. 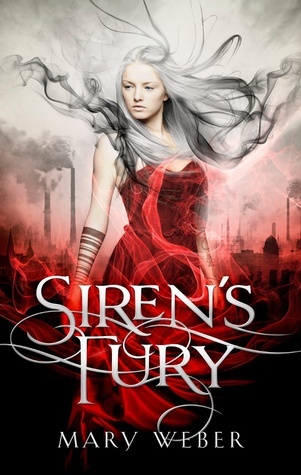 Siren's Fury picks up right where Storm Siren left off -- so you're immediately wrapped back up into the emotion you felt at the end of the last book. From there it hits the ground running, because Nym has a BIG problem that she is trying to fix so of course she is going to go barreling into trying to fix it. The book is aptly titled, as a lot of what Nym feels in this part of the story is fury, anger, rage. The whole idea of not letting your emotions control you is taken to a whole different level when you have supernatural powers. There were times when she was so blinded by it that I was screaming at the book, "Nym!! NO!!" But then I always got to cheer when she came back to herself. Nym has changed from the first book because now she has not just had owners and masters; she has had friends and she still does. This changes her motivations for action in a good way. There seemed to maybe be a few too many moments of, "He got away again?!?!" to the point where it was a little frustrating. Myles is a perfect shady character because I just feel creepy and slimy every time I read about it. And I really liked Rasha's unfailing support of Nym. While not as much of a cliffhanger as the ending of Storm Siren, Mary did still leave us with some quite intense loose ends. However, while at the end of the first book it was like, "Everything hurts and how is she going to make this good again???" I left this book more optimistically -- I believe she can make it good again and I'm looking forward to seeing how she is going to do it.